Father John Vianney, the beloved Cure of Ars, is the patron saint of parish priests for good reason. His simple way of life, his compassion for the poor, his long hours in the confessional, and his heartfelt celebration of the Mass endeared him to his parishioners, as well as to the countless Frenchmen who traveled many miles to receive the sacraments from this holy man. 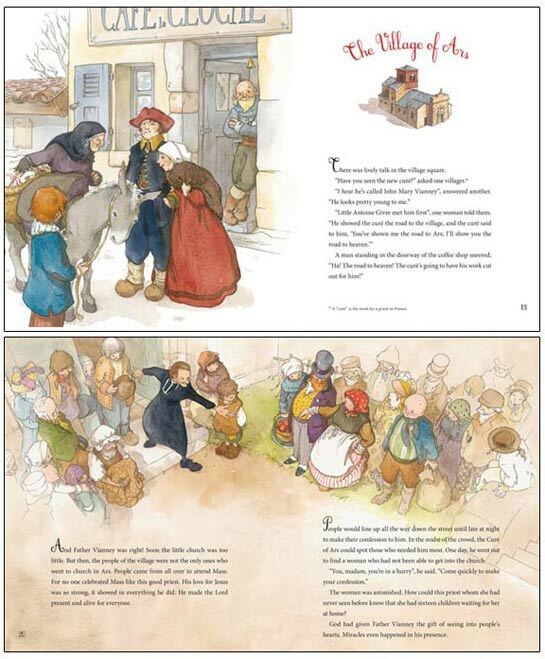 In this tenderly and colorfully illustrated story, children will learn how John Vianney heard his calling to the priesthood when as a young boy during the French Revolution he attended underground Masses with his devout family. They will also learn how he struggled in school, yet persevered in his studies until his dream to be a priest was realized. When Father Vianney was assigned to the parish in Ars, he found that the faith and religious practice of the local people had been weakened by the Revolution and the rise of Napoleon. He ate and slept very little as he poured himself out for the salvation of souls. His reputation spread far and wide, and in the last years of his life, he spent up to seventeen hours a day hearing the confessions of people from all over France. With his kindness, wisdom and occasional miracle, Father Vianney won over many hearts, and he was mourned by thousands when he died in Ars at the age of 73. The woman was astonished. How could this priest whom she had never seen before know that she had sixteen children waiting for her at home? God had given Father Vianney the gift of seeing into people’s hearts. Miracles even happened in his presence.” Illustrated.